DIAMOND's uniquely shaped hangers will lend a striking industrial flourish to your door. We recommend pairing it with one of our premium pine doors for maximum appeal. Flat rail dimensions: 78-3/4" L x 1/4" W x 1-9/16". Steel with a durable black powder coated finish for interior applications. Door track kit for openings up to 36. Accommodates a single door up to 1-3/8 thick. Weight capacity per kit: 300 lbs. Premium ultra-quiet rollers. 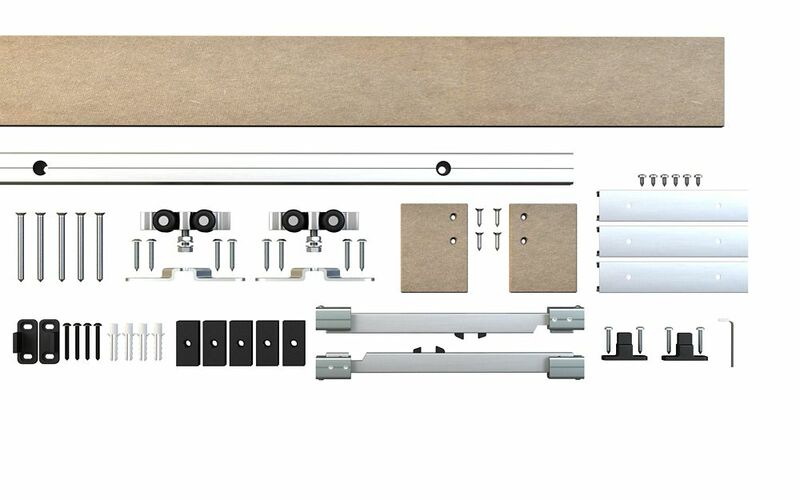 Traditional-Style Concealed Rail System For Decorative Barn Doors This complete concealed hardware set ensures easy installation of a standard wooden door. The set includes a decorative MDF band and two end caps ready to paint to hide the door trolleys and track. Traditional-Style Concealed Rail System For Decorative Barn Doors is rated 2.8 out of 5 by 4. Rated 1 out of 5 by JDen from Poorly designed, terrible instructions I purchased this several months ago. The installation instructions are terribly written, and when followed to the letter, leave the door dragging on the ground and the roller impacting the soft closer before the door is fully closed. There are also several pieces left over that are unaccounted for in the installation instructions. I was able to make the system work by altering the installation; significantly modifying the placement of the rollers and cutting down the height of the soft close tabs. Despite these setbacks, I was able to make the installation work, and have been satisfied with the product. A re-write of the installation manual would be a great idea, as the product is good, but is incredibly frustrating to install. Rated 4 out of 5 by Franny from Sleek design This is a sleek option when you need barn door hardware. We used this for our renovated laundry closet as the regular door wouldn't fit any more. You can paint it to match your trim or walls. The only down side is that there are no patches for the screw holes at the end caps, which doesn't look great. Works well though. Rated 5 out of 5 by Ueejit from Expensive but worth it I had trouble finding a rail system for the new door we installed as it was larger and heavier than our other doors and I found this on Home Depot website and ordered it knowing little about the product. So far we are 100% satisfied with the rail system. We have other such systems for other doors in our cottage and this one operates the smoothest and feels the most solid as compared to them. Be aware, the valence that goes over the rails is just plain MDF, so no style points there, but we wanted a solid rail system and that's what we got. Does this set include the door? Thanks. Hello, thank you for your question. Sorry, the door is not included. I hope this helps. Best regards. Customer care team. Can you get this product with 3 doors instead of 2 ? Hello, thank you for your question. This kit is for one door weighing up to 80 kg (176 lbs). The door is not included. I hope this helps. best Regards. Customer care team. Does the door have gliders mounted to the wall or on the floor? Not really sure what you are referring to when you say gliders but I am assuming you are meaning bottom guides. It appears from the item picture description that they mount on the floor. Is it possible to install the monuting system from the ceiling instead of the wall? No that would not be possible. The door size is what ever you want for height and for width with what I can get from their incorrect labeled sizes would be up to a 36 inch wide door. How much clearance is required to install this? If the assembled height is 3.54 inches, is that the required free space above the door to install?